Borgo Maggiore is one of the nine municipalities called castelli in the Republic of San Marino. It’s actually the second largest municipality in the republic and its main market town. Borgo Maggiore and San Marino historic centers together with Mount Titano are inscribed on the UNESCO World Heritage List in 2008. We stayed in San Marino City and thoroughly explored it (still need to blog about it ) but I also visited Borgo Maggiore. 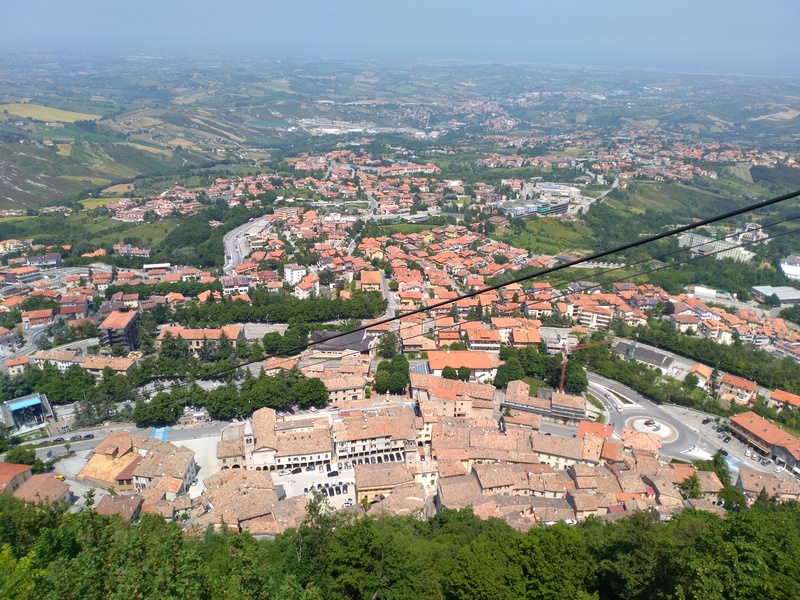 You can admire the main square of Borgo Maggiore from the viewing point next to the cable car station in San Marino City. Besides, you actually drive through Borgo on your way to San Marino City high up on Mount Titano. 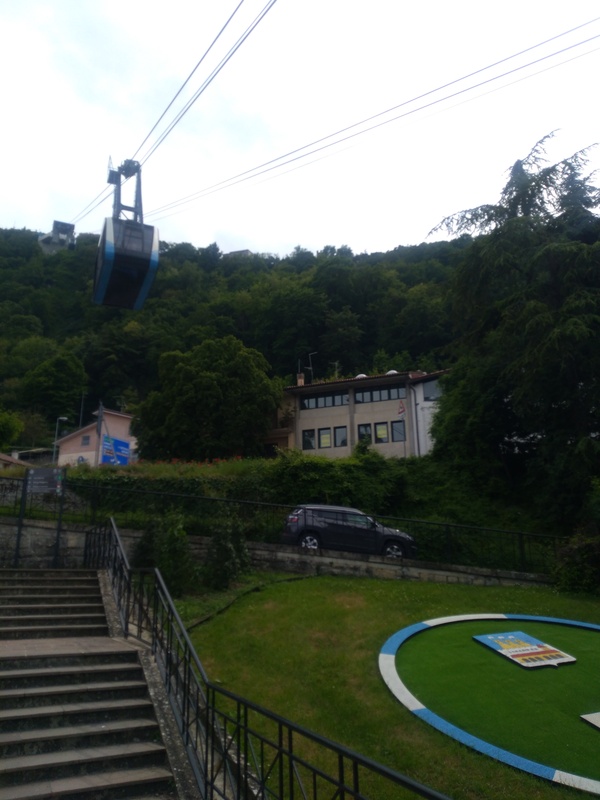 However, I really enjoy cable car rides so I decided to go down to Borgo Maggiore for a short walk while my husband and the baby stayed in San Marino. Plus, it was nice to have some alone time. The usual advice for the first time travel with a baby is to either go somewhere you’ve been before and know quite well so you don’t feel pressure to see it all or to choose a relaxing holiday in the countryside or by the sea where you don’t have much going on so you can all relax and follow the baby’s usual schedule of feeding and sleeping times. But I wanted to go somewhere new, so that it’d be exciting for us all. I was reluctant to fly with my six and a half month old baby and felt that a road trip is a better solution for me. That decision ruled out a lot of places. Also, I thought that we shouldn’t drive for more than 5 or 6 hours in one direction. Salzburg was my initial idea but then I thought of Italy and chose Udine as our first day trip abroad. Suddenly it hit me: There’s a tiny country in the middle of Italy which I haven’t visited yet. San Marino! I quickly looked for accommodation options and read about sights in San Marino (haven’t found a lot of blog posts about it though) before I shared my decision with the husband. He too was more inclined to visit San Marino than to go to Austria because it meant that we get to visit a new country. Furthermore, there’s a rather surprising connection between Croatia and San Marino because San Marino was founded by Saint Marinus, a stonecutter from the island Rab in Croatia. Back then (4th century) Rab was a part of the Roman province of Dalmatia from where St.Marinus fled to Rimini before he founded San Marino on Mount Titano. I always check the length of a road trip on Google maps and on ViaMichelin site and San Marino was exactly what I asked for: five and a half hours drive. However, the actual trip lasted longer because we had to take more stops than I’d planned and we visited Imola on the way to San Marino. The return trip was a bit shorter because we didn’t have any car problems. But we also visited Rimini before we headed home so again the trip lasted more than the initial assessment. 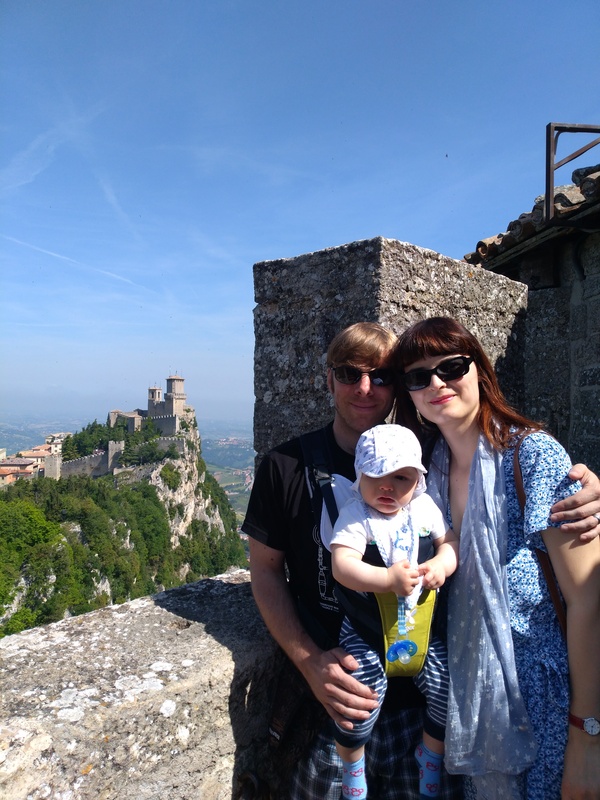 San Marino proved to be a great destination for our first proper trip as a family. We arrived to San Marino on Friday evening and left on Monday morning which meant that we had two full days to explore the City of San Marino, the capital of the Republic of San Marino. San Marino is a tiny independent country in northern Italy close to the Adriatic Sea. It’s the third smallest country in Europe (after Vatican and Monaco) and the oldest republic in the world. There are no borders between Italy and San Marino. The official language is Italian and the currency is euro. San Marino town is perched atop Monte Titano which is the highest peak in the country at 739 m above sea level. There are several settlements in San Marino country called castelli (castles) and they are: City of San Marino, officially Città di San Marino, Acquaviva, Borgo Maggiore, Domagnano, Faetano, Fiorentino, Montegiardino, Serravalle and Chiesanuova. Actually we drove through several of these on our way up to San Marino town and I’ve also visited Borgo Maggiore. Enjoy the photos of beautiful San Marino town, the capital of Republic of San Marino.